Professional Service Agreements are all about access. View them as the golden key that opens investment opportunities unavailable anywhere else, while minimizing your personal time, effort, and risk. Strongbrook REIC delivers access to the ultimate real estate Power Team complete with education, application and properties in your own market or the best ones in the country. Our Professional Service Agreements (PSAs) give you access to Strongbrook’s power team for life – this includes the team, the deals and the life-changing options that they provide. Strongbrook’s $5,499 PSA provides full access to custom coaching, as well as access to the real estate power team for one (1) real estate transaction. The $7,999 PSA provides the same benefits, but allows you to transact up to four (4) properties. Our most popular PSA allows you to transact an unlimited number of investment property deals for a one-time fee of $15,999. Your customized Game Plan will identify which PSA would be the best fit for you. Regardless of which service option you choose, we believe that your PSA will pay for itself and then some (potentially on your first real estate purchase). Your Essentials, Empowerment, or Elite PSA will allow you to immediately begin successfully transacting real estate in your own backyard or in the best markets all around the country. Now is the best time to begin investing so you’ll want to get started as soon as possible. The PSA you choose will determine the number of properties you can transact with the Strongbrook REIC Power Team. Access to Strongbrook REIC’s most elite investment properties in the hottest real estate markets. Access to Strongbrook REIC’s exclusive property financing services, tailored for investors. Access to professional property management services that coordinate both the rehab of ready-to-purchase real estate inventory, as well as rental management and ongoing maintenance services. Unlimited Access to the Strongbrook REIC Power Team, with seasoned experts in every discipline required for a successful real estate investment program. Unlimited Access to one-on-one Coaching to help you map out your customized investment program. A personal Client Services Coordinator to guide you throughout the entire investment process. Unlimited Access to on-demand, online education and special reports. Unlimited Access to Strongbrook’s Strait Path Intensive workshops, annual Wealth Summits, and quarterly Bootcamp events. Find out which PSA is right for you! A team of hundreds of licensed experts who facilitate real estate investment in the country’s best markets. A team that has successfully transacted hundreds of millions of real estate within our strict parameters. Successful real estate experience in both up and down markets with thousands of clients. A personal Project Manager and our team save each client over 300 hours per transaction. The savings we offer in discounted markets, discounted rehab, and discounted property management can sane you many thousands of dollars on each deal. Unlimited access to Strongbrook’s on-demand education and live, to make good decisions, and have the team facilitate their execution. Access to Strongbrook’s best investment properties. Strongbrook facilitates the home purchase, manages the rehab, evaluates the tenants, manages the property, and monitors the implementation of the exit strategy to manage the assets of the portfolio with optimum equity and cash flow. Access to every necessary real estate function in one company. Clients have 100% ownership of their properties, which includes keeping 100% of gains, cash flow, appreciation, and tax benefits. Strongbrook helps actively monitor your portfolio and recommends the best times to buy, sell, and upgrade. Because we initiate such a high volume of loans, our mortgage company can offer better rates and better lending options using over 50 different banks. Individual client benefits from volume property management. Clients receive training and implementation assistance on insurance strategies that minimize taxes and protect assets form litigation risk. Strongbrook creates clients for life with a significantly increased likelihood of their retirement funds outliving them, and monthly cash withdrawals which do not reduce the account value. Strongbrook provides systems for passing on wealth with maximum benefits and minimum loss through estate plans and LLCs. 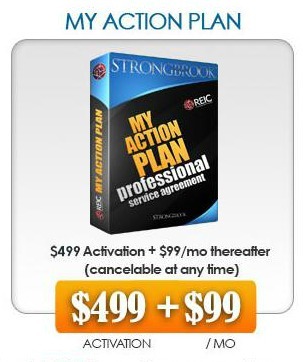 The My Action Plan PSA (MAP PSA) affords everyone the opportunity to gain immediate access to Strongbrook REIC’s Power Team and education, even if you cannot immediately transact a property. Many people need 6-12 months to get into a financial position to begin transacting real estate. The MAP PSA is designed to give you immediate access to the game plan options and training you need to prepare for purchasing your first investment property in the near future. Earn Strongbrook Loyalty Points redeemable for discounts on the Essentials, Empowerment or Elite PSAs. Strongbrook Loyalty Points are also redeemable for discounts on PSA upgrade fees. My Action Plan PSA subscribers earn Strongbrook Loyalty Points. Loyalty Points earned may be applied on a one (1) point = one dollar ($1) discount on the future purchase of a Strongbrook Essentials PSA, Empowerment PSA, or Elite PSA. All MAP PSA subscription fees, Activation fees, and the Home Study Kit (with MAP PSA) are eligible for Loyalty Points at a ratio of one (1) point for each one dollar ($1) spent. Strongbrook’s Loyalty Points have no cash value, are not transferable, and are not redeemable for cash. Loyalty Point accounts may not be combined with other points from other account holders. Loyalty Points only expire if you have 24 consecutive months of no new Loyalty Point accumulations. This means you can “pause” your My Action Plan PSA monthly subscription if need be, and never lose a Point, as long as you have at least one (1) month’s subscription per any 24 month period.